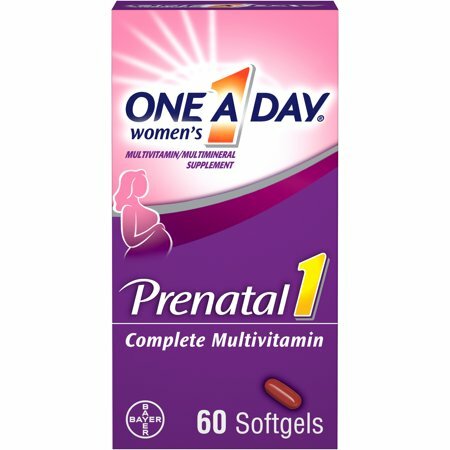 One A Day Women's Prenatal 1 is a complete prenatal multivitamin that offers a wide variety of key nutrients in an easy-to-take Softgel designed for women through every stage of pregnancy. Adding a prenatal multivitamin to your daily routine is an important step in providing nutritional support for pregnant women and babies throughout pregnancy and breastfeeding. This daily prenatal multivitamin contains key nutrients such as Folic Acid, Omega-3 DHA, Calcium†, Vitamin D, and Iron. DHA is an Omega-3 fatty acid that can help support healthy fetal brain and eye development. * One A Day Multivitamins can provide nutritional support that you and your growing family may need. Help yourself get nutrients you may be missing out on with One A Day Women’s Prenatal 1 Multivitamin with DHA. One A Day Women’s Prenatal 1 Multivitamin provides 200mg of DHA to help support healthy fetal brain and eye development. * Use of One A Day Women's Prenatal 1 Multivitamin should be consistent throughout pregnancy and continued while breastfeeding as DHA will pass from mother to baby in breast milk. Choose a complete multivitamin with more of what matters for you and your baby with One A Day Women’s Prenatal 1 Multivitamin. A serving of One A Day Women’s Prenatal 1 Multivitamin contains 100% Daily Value of Vitamin D. This essential nutrient works together with calcium to support bone health. * Your Vitamin D intake is supplemented by these easy-to-take softgels. One A Day Women’s Prenatal 1 Multivitamin is free of gluten, wheat, dairy, artificial flavors, and artificial sweeteners. It’s important to know what you’re putting into your body, even in your multivitamin supplements. † Contains 200 mg caffeine vs. 300 in two-pill formula. Stop Use Indications: Allergen: Soy;KEEP OUT OF REACH OF CHILDREN. CHILD RESISTANT CAP. If pregnant, breast-feeding, taking medication, or have any medical condition ask a health professional before use. Not for children. WARNING: Accidental overdose of iron-containing products is a leading cause of fatal poisoning in children under 6. Keep this product out of reach of children. In case of accidental overdose, call a doctor or poison control center immediately. Do not use if safety seal bearing SEALED for YOUR PROTECTION under cap is torn or missing. Ingredients: Calcium Carbonate, Omega-3 Fish Oil, Gelatin, Glycerin, Magnesium Oxide, Yellow Beeswax, Ascorbic Acid; Less Than 2% of: Beta-Carotene, Biotin, Carbonyl Iron, Cupric Oxide, D-Alpha Tocopherol, D-Calcium Pantothenate, FD&C Blue 31, FD&C Red #40, Folic Acid, Niacinamide, Potassium Iodide, Purified Water, Pyridoxine Hydrochloride, Riboflavin, Soy Lectin, Thiamine Mononitrate, Titanium Dioxide (Color), Vitamin A Palmitate, Vitamin B12, Vitamin D3 (Cholecalciferol), Zinc Oxide. Active Ingredients: Calcium Carbonate, Omega-3 Fish Oil, Gelatin, Glycerin, Magnesium Oxide, Yellow Beeswax, Ascorbic Acid; Less than 2% of: Beta- Carotene, Biotin, Carbonyl Iron, Cupric Oxide, d-Alpha Tocopherol, DCalcium Pantothenate, FD&C Blue #1, FD&C Red #40, Folic Acid, Niacinamide, Potassium Iodide, Purified Water, Pyridoxine Hydrochloride, Riboflavin, Soy Lecithin, Thiamine Mononitrate, Titanium Dioxide (color), Vitamin A Palmitate, Vitamin B12, Vitamin D3 (Cholecalciferol), Zinc Oxide. Instructions: Adults: One tablet and one liquid gel daily, with food. Used all through pregnancy and while breastfeeding. I highly recommend these to anyone who has a hard time with prenatals upsetting your belly. I tried many different kinds when i was first pregnant. They all kept either making me very nauseated or gave me heart burn. These did not. The coating on then helped swallow them too. I will definately use these again in the future if there is another baby to come along. Great product! !